There, said it! Zionism contradicts not only human rights but also universal justice. Zionism is above all. No less than the Israeli Minister of Justice Ayelet Shaked said this at a conference organized by the Israeli Bar Association in Tel Aviv. Haaretz journalist Gideon Levy call her “Israel’s Minister of Truth.” Right-wing Zionist ideology negates human rights. Shaked and their ilk have been very critical of Israel High Court of Justice. In her speech, she criticized the court for giving insufficient attention to Zionism and the country’s Jewish majority. Zionism and the challenges the country is facing have become a blind spot, which carries no certain weight in comparison to individual rights. According to her, demography and the Jewish majority should be taken more into consideration. 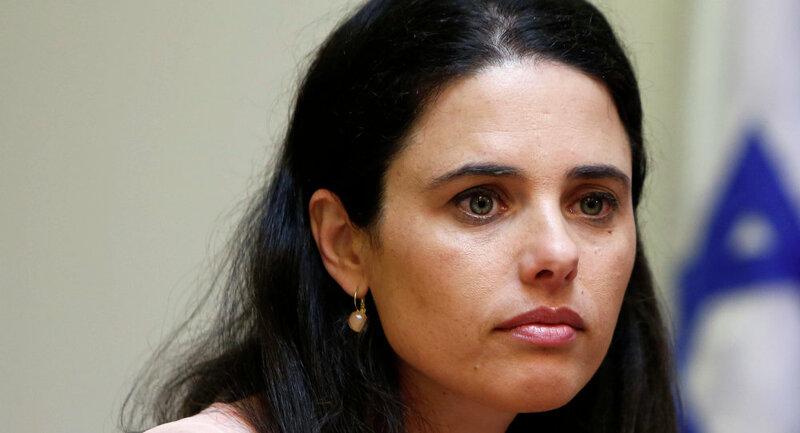 Shaked belongs to Naftali Bennett’s nationalistic “Jewish Home” Party. This party together with the right-wing settler movement have hijacked Zionism and transformed it into a nationalistic, racist, and fascist-like ideology. Under Josef Burg, the long-time Interior Minister of Israel, the “National-Religious Party” was a religious liberal, conservative party. Let’s be thankful to Shaked. Finally, she revealed the real face of Zionism, which anybody already knew who did not see things through rose-colored glasses such as the so-called Zionist left from the Labour party or the former Meretz party. They have been justifying the injustices, the racism, the occupation regime and the Apartheid system over decades. It’s a pity that the West still accepts their hypocrisy. They are the so-called “good Israelis” in contrast to the Likudniks, not to speak of the Shakeds, Bennetts, Libermans and their ilk. The disenchanting of the real face of Zionism by Shaked and Gideon Levy praise of this invited severe contradictions by so-called liberal Zionists such as Ravit Hecht. According to her, a “fragrance of true love exudes from Levy’s text to his honest, brave princess.” Hecht tries to save the real Zionism because what Levy and his ilk are defending is a “sadistic distortion.” Hecht is wrong by insinuating that Levy and others prefer the leadership of Shaked and their conservative colleagues to the liberal Likudniks. Levy praises Shaked only for speaking the truth about the real Zionism, which is anti-democratic, racist, and anti-liberal. When has Zionism become “a blind spot in the law,” what about Judaism? Hasn’t Zionism perverted and hijacked Judaism on which Zionism made recourse to? Zionism is a form of nationalism whitewashed with pseudo-Jewish rhetoric. The Zionists are using the Jewish religion as a facade to legitimize their racist and expansionist colonialism. The real problems of this ideology ruts in Zionism itself. To get rid of the problems, Israel must get rid of Zionism. These are the real problems Zionism is facing. Levy knows this. That’s why he praised Shaked. She is the one to show the actual face of Zionism to the world. The international community should demand from Israel to become a representative an liberal democracy for all its citizens. One consequence could be an international boycott of the State of Israel.